This year, Cooper Union is thrilled to announce that the class of 2012 raised a record-breaking $40,000 for the Senior Class Gift, exceeding their ambitious goal of donating $37,500, the equivalent of one full-tuition scholarship at Cooper. 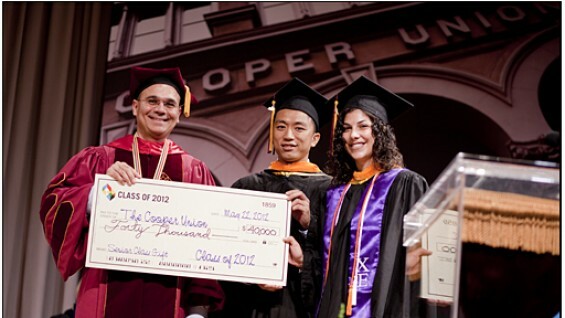 At The Cooper Union’s 153rd Commencement Ceremony on Tuesday, May 22, Senior Council members Christina Milone and Jason Zeng presented a $40,000 check to President Jamshed Bharucha. This check represented the amount that the Class of 2012 raised through their ongoing Senior Gift campaign and the accompanying Senior Gift Challenge. As of June 1, 2012, an amazing 95% of the senior class had participated in the Senior Gift. The class launched its campaign in late March, shortly after spring break, and gifts began pouring in almost immediately. The seniors’ plan inspired alumni Charles Fan (EE ’95), Kenny Yeung (EE ’94) and James Wu (ME ’93) to extend a Senior Gift Challenge, which matched the first $5,000 raised by the senior class dollar-for-dollar, and provided an additional $100 for every 1% class participation the students reached. While the Senior Class Gift drive has already been a tremendous success, seniors are continuing their efforts to reach 100% participation. As Christina and Jason told their classmates during Commencement, donations from members of the 2012 graduating class will continue to count toward the Senior Class Gift through June 30, 2012. To see an ongoing list of the seniors who are supporting the Senior Class Gift, click here. To join in supporting Peter Cooper’s legacy with your own gift to the annual fund, click the link below.